There is no “official” Crop and Pest Report this week, but I wrote up a weather forecast anyway because as we all know, the weather never takes a week off in our climate. If we want to admit it or not, living north of 45° North latitude means that the change to autumn often times begins in the second half of August. Alterations between well-above to well-below normal temperatures and/or precipitation are common in our climate, yet they tend to be more pronounced during the transitional seasons of spring and autumn. The switch from the heat of last week to the chilly air of the past few days is in many ways the first of many such “cool adjustments” we will be experiencing in the next several weeks as we move into the colder period of the year. 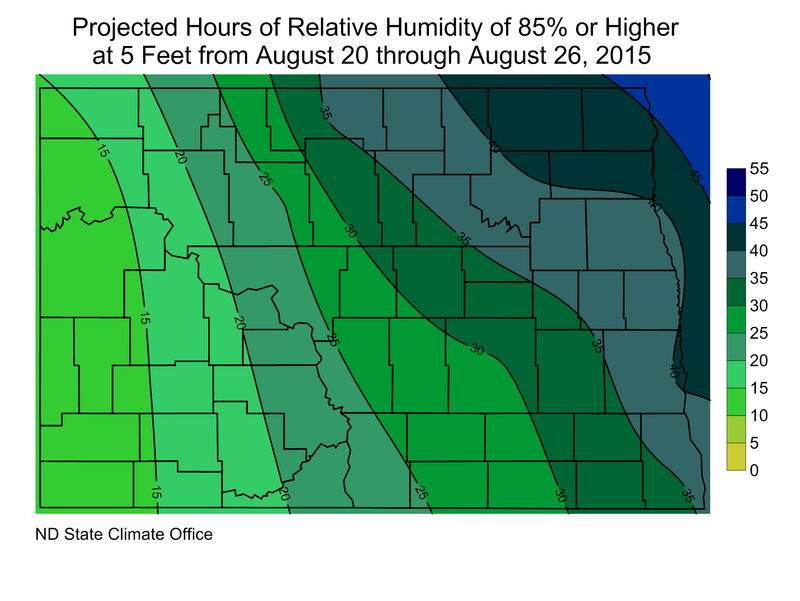 Although the far southern portion of North Dakota and the southern Red River Valley did record some rainfall with the storm that moved through the upper Midwest on Tuesday and Wednesday morning earlier this week, there are still many locations in North Dakota that have recorded little and in some instances no measureable rain yet this month (Figure 1). But that may change on Saturday. Figure 1. 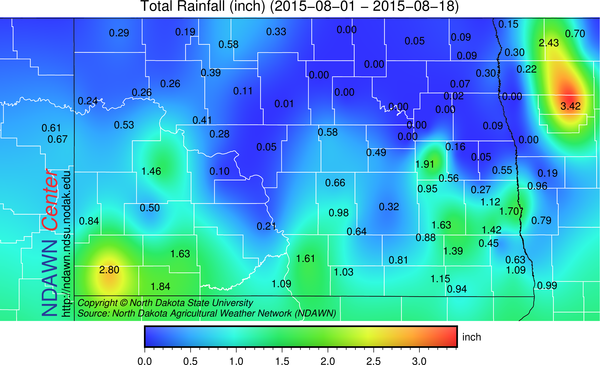 Total Rainfall from August 1 through August 18 at the North Dakota Agricultural Weather Network (NDAWN) Stations. Thursday and Friday will be much warmer as an area of low pressure develops in the northern Rockies that in turn will pull some southern plains heat back into our region. The warmer temperatures will be short-lived as that northern Rockies low pressure center moves east and pushes a cold front through the area. Maximums in the 80s in many locations on Thursday and Friday will be replaced by cooler and cloudier conditions with a good chance of thunderstorms on Saturday. Sunday and Monday will likely remain cool with maximums on the lower side of the 70s expected both days with minimums in the 40s, especially on Monday morning. A warm up is projected for next Tuesday through Thursday as maximums are expected to climb back into the 80s during that timeframe. Right now the main threat of precipitation during this 7 day period appears to be the thunderstorms foreseen on Saturday as the main storm track appears to be staying to our south for much of next week. Beyond the next 7 days, current projections are for another stretch of cooler conditions toward the end of next week with early September starting off on the warm side that in turn would greatly lessen the odds of a statistically early frost this year (before September 10). 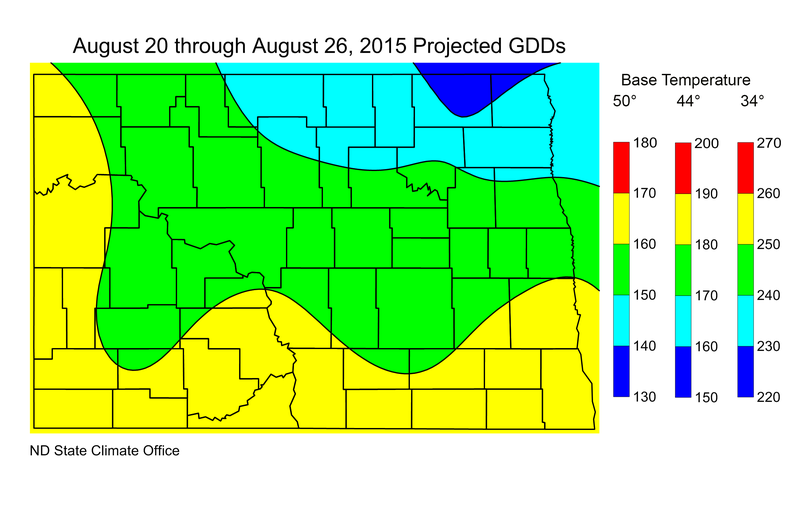 The projected Growing Degree Days (GDDs), base 50°, 44° and 34° for the period August 20 through August 26, 2015 are presented in Figure 3 and the number of hours when the relative humidity is expected to be at or above 85% can be found in Figure 4.